While 8×8 APCs are a familiar view with military forces worldwide, the IDF realized the need for such armored carrier after several clashes in Gaza that exposed the vulnerability and potential high casualty rate for infantry transported in some of the armored mobility platforms to relatively simple threats. The M-113 is known for the inadequacy of its protection, and armies throughout the world consider either phasing it out of service or carry out comprehensive modification of the basic vehicle with better protection, heftier belly protection and more powerful propulsion system and suspensions. The IDF examined some of the foreign vehicles but preferred a locally developed design that could better balance between mobility, firepower, and protection to address the unique Israeli requirements. Weighing less than 35-ton gross vehicle weight (GVW), Eitan uses a combined passive and active armor to achieve the high level of protection required for the mission. What made this possible was the mature level of the Trophy Active Protection System (APS) used with IDF Merkava MBT and Namer AIFV. The Eitan design could rely on this innovative capability retaining a level of base armor to provide ballistic protection from small arms and the residual effects of threats intercepted by the APS. Higher threat levels would be taken by the APS. With this approach a relatively large armored capsule provides large protected space, enough to carry the crew and an infantry squad, saving many tons of weight, making the use of a wheeled platform feasible. For mobility, Eitan adopts a 750 hp engine, off-the-shelf drive train, independent suspension, four of the eight wheels are steerable, enabling the vehicle to take tight turns and move on the road at a speed of 90km/h, and maneuver in narrow roads of urban areas and offroad. Compared to Namer and the current M-113, Eitan will be able to move freely on roads, It will be more useful on roads for long distances, without requiring heavy transporters, thus enabling more agile movements across the country. They will also be more maneuverable in urban terrain, where heavy vehicles cannot easily maneuver. The prototypes used for testing carry one remotely operated weapon station but production models will integrate an unmanned overhead turret armed with 12.7mm heavy machine gun or 30mm automatic cannon (upgradable to 40mm), an integrated active protection system (APS), smoke dischargers and integral 60mm mortar, providing indirect fire capability, that includes high explosives, illumination, and smoke effects. Additional capabilities including guided Spike missiles are also considered. The vehicle is equipped with modern electronic architecture that supports crew stations and large screens for the crew and troops, enabling effective situational awareness depicted by multiple cameras mounted at different spots around the vehicle. The vehicle will be equipped with firepower, protection, power generation and distribution and command, control and communications to provide protected mobility, fire, power, and communications support to the infantry squad. 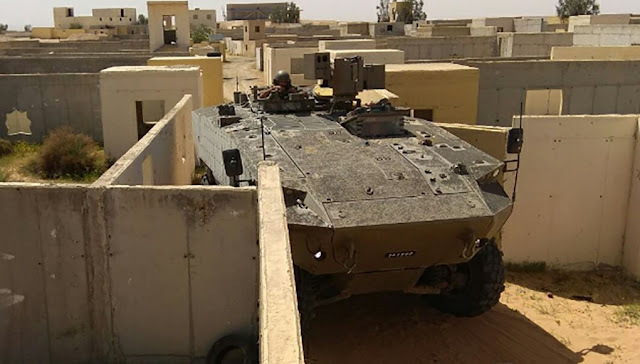 The basic turreted Eitan platform is likely to be used for APC, command and scout roles, while the turretless variant used to support role specific configurations including weapon carriers (mortars etc. ), combat engineering, recovery, casualty evacuation vehicles and more, similar to the roles the M-113 provided, although other protected wheeled platforms, such as the smaller and lighter Sandcat, that could assume some of the roles. 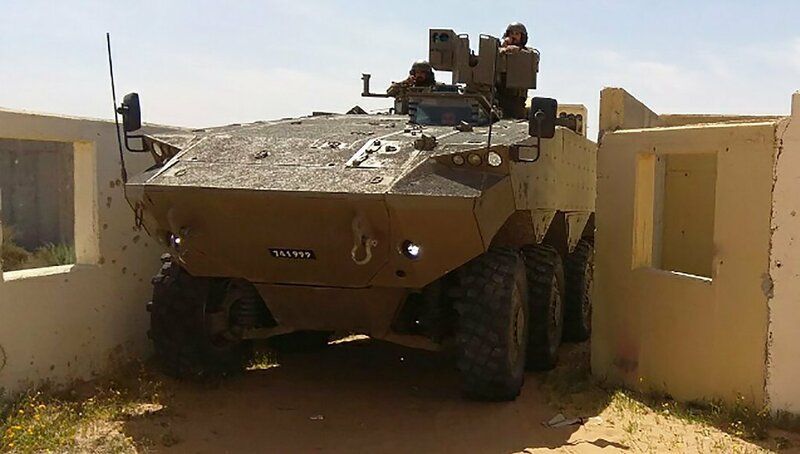 Prototypes of Eitan APCs are already produced and deployed with the Nahal infantry brigade for tests. The brigade, one of the IDF regular infantry brigades, will be the first to equip with the new vehicle Eitan enters serial production of hundreds of vehicles, recently approved by the government under the IDF current multiyear program (2016-2020). Other regular infantry brigades are already equipped with Namer APCs and are expected to enable the brigade elements to move cross country, in formation with tanks. Compared to Namer, Eitan is expected to deliver increased firepower (utilizing the 30mm cannon) thus enabling the vehicle to support its dismounted squad and take a more substantial part in the land battle, performing as an Armored Infantry Fighting Vehicle (AIFV). While Israel depends on foreign nations for the supply of combat aircraft and surface vessels and submarines, the land force has relied on local development and manufacturing of its main platforms. Merkava MBT, Namer heavy APC, the future self-propelled artillery and future tracked combat vehicle (Carmel) are all based on local design. However, fielding of those platforms in large numbers will be a challenge, since the U.S. military support will not allow for local spending as it used to do in the past. This will require moving an increased volume of production to the USA, as was done with the Namer, Iron Dome, and many other locally developed systems. As Eitan enters production, it is likely that U.S. manufacturers will receive the lion’s share of this program, to enable the IDF to meet the tight schedules and lower costs the project requires. Ogden won't like it. Neither will other fans of the Boxer or my European bros that love the Patria AMV (I like that vehicle too by the way), but I think the Eitan is the finest 8x8 on the market today. It checks all the boxes, with its 30mm turret will be a more than capable IFV and has the speed, toughness and bite to take the fight to the enemy. The Israelis have done it again. They've raised the bar on armored warfare...this time in the 8x8 class.